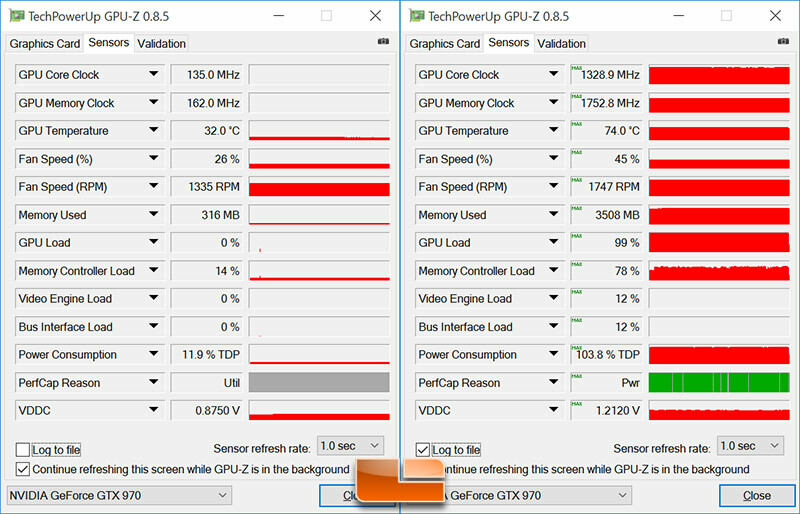 Temperatures are important to enthusiasts and gamers, so we took a bit of time and did some temperature testing on the the ASUS version of the NVIDIA GeForce GTX 950 video card. The ASUS GeForce GTX 970 Mini-ITX card has fans that run at all times. At idle the fan is spinning at ~1300 RPM and the GPU was at 32C. When gaming we topped out at 74C with the fan spinning at ~1800 RPM in a room that was 68C. The AMD Radeon R9 Nano also has fans that run constantly. 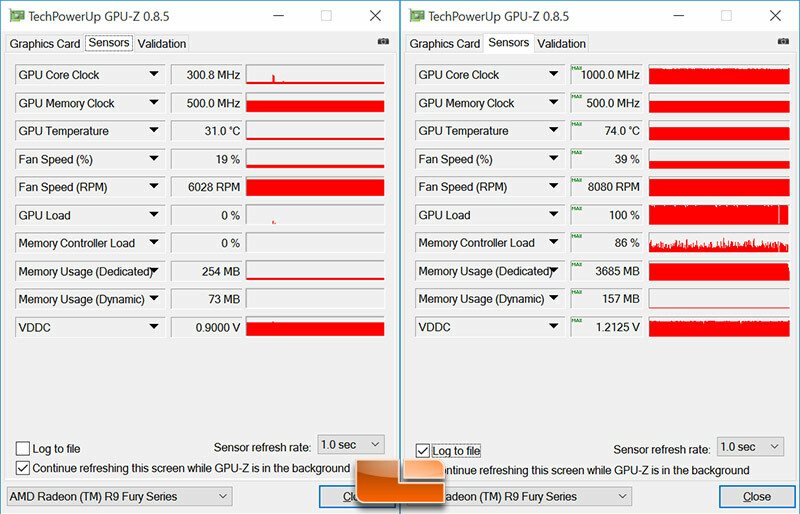 At an idle the fan is running at ~1500 RPM (GPU-Z 0.8.5 does not correctly show the fan RPMs) and the temperature is 31C. When gaming the temperature got up to 74C, which was the same temp as the ASUS GeForce GTX 970 Mini-ITX video card. The thermal properties of these two cards are very close to one another! 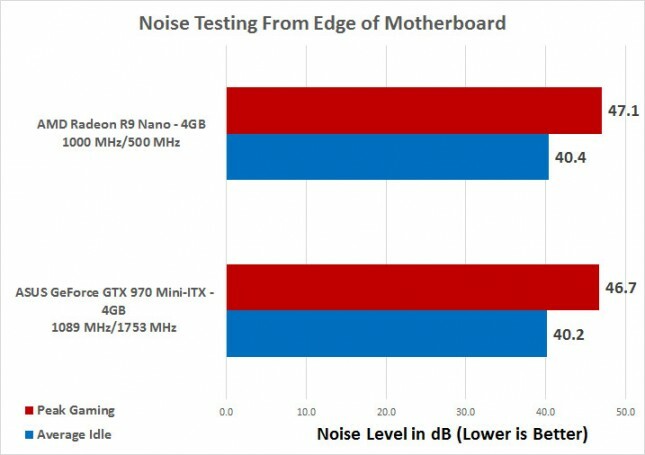 When it comes to noise level, the ASUS GeForce GTX 970 Mini-ITX card and the AMD Radeon R9 Nano were basically identical and they were basically a wash. The one thing that we did notice about the AMD Radeon R9 Nano is that our card unfortunately has some coil whine. AMD has only sent us two Fiji based cards and the Fury X has really bad pump whine and the Nano has choke whine. We know that AMD put a ton of time and effort into making the build quality on this card one that was said to be premium, so it’s really shocking to see that another noisy card was delivered to us by AMD to review. The choke noise on the AMD Radeon R9 Nano isn’t nearly as bad as the pump whine on the Fury X, but it’s something we don’t expect to see on a $649 video card here in 2015 where premium components are readily available.